For the past 3 months, E-creation has been working on a substantial e-commerce website build using the Magento open source e-commerce platform. The website has been created to take the client from sub £1m turnover per annum to £2m+ per annum with a complete business process & infrastructure to meet this aggressive target - all directly driven & run by the e-commerce website & business integration. However, the key functionality enabling the client to grow so aggressively is the Sage 200 Magento integration through a custom written Sage 200 Magento connector. 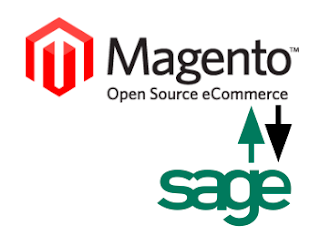 There are Sage 50 (a significantly simpler product when compared with Sage 200) to Magento connectors but only one Sage 200 Magento connector that E-creation could find. After tests using the Zynk / Internetware Sage Connector, E-creation chose to write its own Sage 200 to Magento integration connector in order improve on elements of that would not perform the functions required by the client. SAGE Magento Integration Connector is now available through E-creation as part of Magento e-commerce website projects requiring Sage 200 integration or as part of stand alone Sage 200 integration projects at a price of £5,500 + VAT. If your business uses Sage 200 (typically a business with a turnover in excess of £1m per year), E-creation's SAGE Magento Integration Connector can help make your business significantly more efficient by integrating your website with your Sage accounts system. Easier management of product data, inventory levels, categories & price changes. How does SAGE Magento Integration Connector achieve this?